Princess Eugenie looks stunning in her Erdem Hetty floral embroidered cap sleeve dress when the palace announces her engagement today. The Queen’s granddaughter gets engaged to her partner Jack Brooksbank. Her dress is a silk-organza embroidered number with a modest turtleneck and pleated hemline. She matches her dress with Jimmy Choo shoes and flaunts her pink padparadscha sapphire ring. The 27-year-old princess and her boyfriend Jack Brooksbank pose for their official engagement photo at Buckingham Palace in London after they announce their engagement. The royal admits that she cried and felt over the moon when her boyfriend popped the question and got down on one knee while they watched the sun set over a volcano in Nicaragua earlier this year. Her thrilled parents announce her engagement online. Queen Elizabeth was very happy and she was among the first people to know about the engagement. 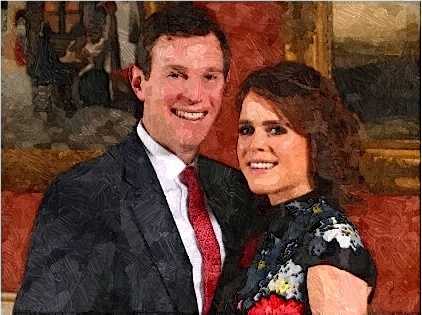 Meanwhile, Princess Eugenie’s recent engagement adds a great joy to the British Royal Family. Her cousins Prince William and Prince Harry earlier announced exciting news too. Duke and Duchess of Cambridge’s third baby and Prince Harry is having a royal wedding to Meghan Markle in May.